David Bomberg, Sappers Under Hill. © the artist's family. 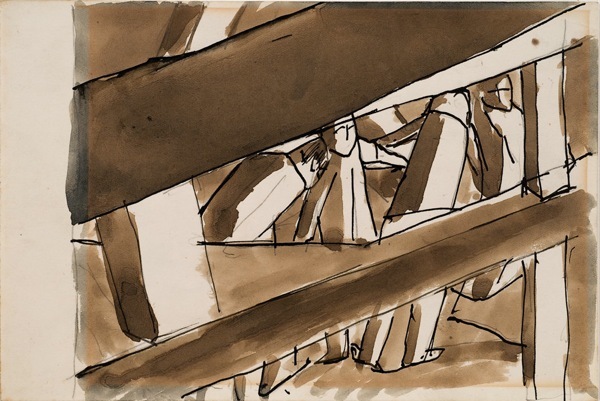 Drawings by esteemed British artist David Bomberg will go on show next week at the London Jewish Museum of Art, in the Ben Uri Gallery, The works were purchased from Christie's back in July with help from the Art Fund. The Art Fund is a national charity in the UK that raises money to help museums and galleries to purchase works of art in order to enrich the range and quality of art in the UK. The Art Fund helped towards the cost of Bomberg drawings, which sold at auction for £7,115 and will now be shown for the first time at the gallery. David Bomber was born in Birmingham in 1890, to Polish-Jewish parents. His family moved to Whitechapel in East London in 1895, and growing up in the East End he was able to build close relationships with many of the Jewish artists and writers in the area. In 1913, Bomberg made an important trip to Paris with sculptor Jacob Epstein, where he met Pablo Picasso, Andre Derain and Amedeo Modiglioni. With a great many connections and important influences, Bomberg developed a style of working and an oeuvre that ensures that he is listed amongst the most original and exciting painters of his generation. The drawings that will go on show are entitled The Family, Ghetto Theatre; Ghetto Theatre and Sappers under Hill 60. The first two works are depictions of life in the East End, showing scenes of the Jewish Theatre audience. Having been created in 1919, the drawing have a dar lingering sense of depression following the atrocities of the First World War. The third drawing is a war time artwork looking at the men who built tunnels and trenches; a task that Bomberg himself was familiar with after he joined the Royal Engineers in 1915. During the Second World War, Bomberg was made an official war artist, but only managed to complete one commission during that time which was Bomb Store of 1942.